Hamburger Börs in the heart of Stockholm is one of the Swedish capital’s most illustrious venues for live music, dinner shows and corporate events. Having existed in one form or another at the same location or another for nearly three centuries, the original venue was finally demolished in the 1970s during the expansion of the city’s underground system. A new venue was built on the same site and has continued to thrive, welcoming the likes of Sammy Davis Junior, Liza Minnelli, Tower of Power, Grace Jones, Rod Stewart and many, many more. Now part of the Wallmans group of dinner show clubs throughout Scandinavia, Hamburger Börs continues to host major international artists and prestigious corporate events. When the time came to upgrade their reliable but aging FoH and monitor consoles, Hamburger Börs FoH engineer and head of sound, David Granditsky, had no hesitation in opting for a pair of Innovason Eclipse GT consoles complete with two DioCore racks - one with 64 inputs and the second with 48 outputs to handle the monitor systems - and three SR16 mobile stageboxes that replace the venue’s old analogue snakes. The entire system was supplied and commissioned by Brollan Söderström of Electrosound, Innovason’s exclusive distributor in Sweden. "We’ve had two Innovason Grand Live consoles since 2001, and while they still work perfectly well, they are quite old ladies now and we felt it was time to upgrade to more modern technology," explained Granditsky. "We explored a number of other options, but ultimately we decided to stay with Innovason because firstly, they ticked all of our boxes in terms of system requirements, and secondly we’ve always had excellent support from Electrosound and Innovason. We are a very demanding client from the point of view of technical support and service, and Brollan and Innovason have never let us down. We have never, ever had to cancel a show due to technical problems." Granditsky was looking for a system based on an audio network that would minimize bulky analogue cable runs and facilitate system configuration. Onboard effects were also cited as an important factor, along with size and weight. 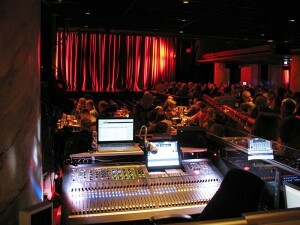 "We sometimes need to move the monitor console down from the balcony where it is normally situated. This is now a considerably less daunting task than it was previously!" said Granditsky with a grin. "Also, the fact that the Eclipse has such a small footprint has enabled us to gain six more seats, which is another bonus. In terms of functionality, I particularly like the way that Innovason handles Overram functionality (the ability to edit individual parameters in existing snapshots) and offline editing on the Eclipse. In my view, the competition doesn’t manage this as efficiently. We also like the M.A.R.S. recorder – we used it the other day to record a live album that was released a couple of weeks after the opening of the current show and it worked like a dream! It’s also very convenient for setting up shows as we can sound check singers without the band being present, or vice-versa." 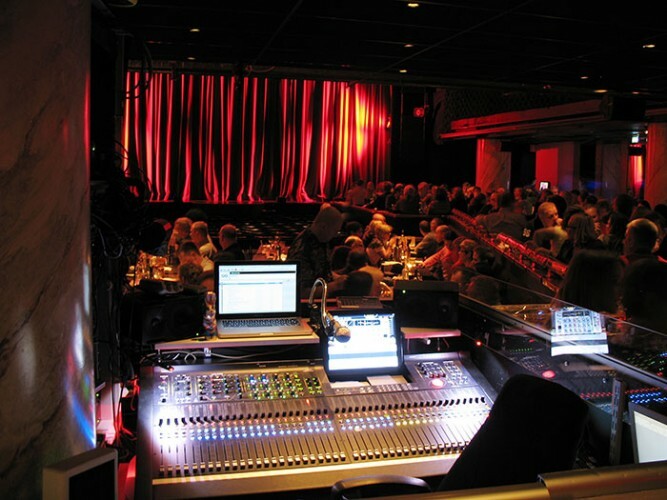 "This setup means that the venue can swap quickly and easily between any number of system configurations, which was one of the major considerations for the new mixing system," confirmed Brollan Söderström. "We can now switch over from one configuration to another with virtually no analogue repatching. Monitor outputs are swapped between the monitor and FoH desks by simply following the EtherSound hierarchy. The four stageboxes are set up in such a way that some are in constant use for managing the long-running live shows, while others are available for visiting guest productions, thus avoiding the need for analogue repatching between different productions and shows. The system is perfectly tailored to the venue’s requirements, and I know that David and the other sound guys at the club are delighted with the results."